Here are some snazzy birthday facts about 19th of October 1955 that no one tells you about. Don’t wait a minute longer and jump in using the content links below. Average read time of 10 minutes. Enjoy! What day was my birthday Oct 19, 1955? October 19, 1955 was a Wednesday and it was the 292nd day of the year 1955. It was the 42nd Wednesday of that year. The next time you can reuse your old 1955 calendar will be in 2022. Both calendars will be exactly the same! This is assuming you are not interested in the dates for Easter and other irregular holidays that are based on a lunisolar calendar. There are 184 days left before your next birthday. You will be 64 years old when that day comes. There have been 23,192 days from the day you were born up to today. If you’ve been sleeping 8 hours daily since birth, then you have slept a total of 7,731 days or 21.17 years. You spent 33% of your life sleeping. Since night and day always follow each other, there were precisely 785 full moons after you were born up to this day. How many of them did you see? The next full moon that you can see will be on April 19 at 11:14:00 GMT – Friday. Fun stat: Your first one billion seconds (1,000,000,000) happened sometime on June 27, 1987. If a dog named Paw - a Cocker Spaniel breed, was born on the same date as you then it will be 272 dog years old today. A dog’s first human year is equal to 15 dog years. Dogs age differently depending on breed and size. When you reach the age of 6 Paw will be 40 dog years old. From that point forward a small-sized dog like Paw will age 4 dog years for every human year. The League of Nations places economic sanctions on fascist Italy for its invasion of Ethiopia. Streptomycin, the first antibiotic remedy for tuberculosis, is isolated by researchers at Rutgers University. Iran becomes the first country to accept technical assistance from the United States under the Point Four Program. The Soviet Union and Japan sign a Joint Declaration, officially ending the state of war between the two countries that had existed since August 1945. The United States Navy conducts Operation Nimble Archer, an attack on two Iranian oil platforms in the Persian Gulf. What does my birthday October 19, 1955 mean? Your birthday numbers 10, 19, and 1955 reveal that your Life Path number is 4. It represents growth, building and foundation. You are practical, down to earth with strong ideas about right and wrong. The following celebrities also have the same life path number: Ryoko Yonekura, Richard Jeni, Jonathon Dutton, Ciara, Matt Papa, Mimsy Farmer, Nicole de Boer, George Peppard, Julia Louis-Dreyfus, Skream. What is the birthday horoscope for Oct 19, 1955? The Western zodiac or sun sign of a person born on October 19 is Libra ♎ (The Scales) – a cardinal sign with Air as Western element. The ruling planet is Venus – the planet of love and beauty. According to the ancient art of Chinese astrology (or Eastern zodiac), Sheep is the mythical animal and Wood is the Eastern element of a person born on October 19, 1955. Fun fact: The birth flower for 19th October 1955 is Cosmos for constancy. What is the Love Match for Oct 19, 1955? When it comes to love and relationship, you are most compatible with a person born on June 19, 1984. You have a Love Match compatibility score of +145. Imagine being in love with your soul mate. On the negative side, you are most incompatible with a person born on May 7, 1941. Your incompatibility score is -131. You’ll be like a cat and a dog on a love-hate relationship. Arf-arf, I want to bite you. Meow-meow, stay away from me! How many babies were born on October 19, 1955? Base on the data published by the United Nations Population Division, an estimated 99,438,148 babies were born throughout the world in the year 1955. The estimated number of babies born on 19th October 1955 is 272,433. That’s equivalent to 189 babies every minute. Try to imagine if all of them are crying at the same time. What is the popular baby name on 19 Oct 1955? 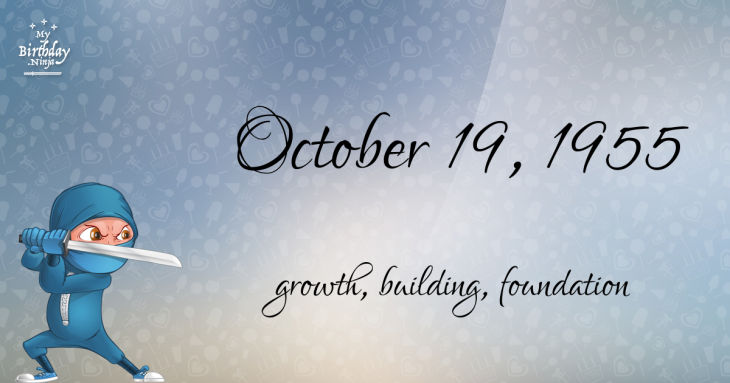 Here’s a quick list of all the fun birthday facts about October 19, 1955. Celebrities, famous birthdays, historical events, and past life were excluded. 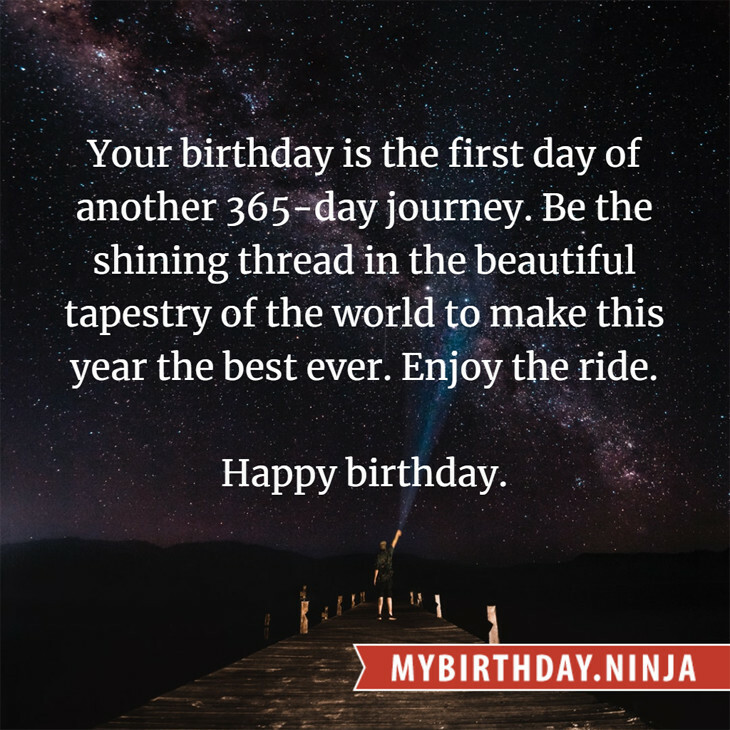 Try another birth date of someone you know or try the birthday of these celebrities: April 12, 1965 – Kim Bodnia, Danish actor and screenwriter; March 11, 1961 – Claudine Mercier, Canadian singer and actress; March 8, 1974 – Fardeen Khan, Indian actor.